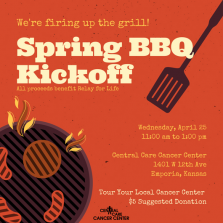 The public is invited to attend the “Spring BBQ Kickoff,” on April 25 from 11 a.m. to 1 p.m. at Central Care Cancer Center, The barbecue will be held in the Central Care parking lot, located at 1401 W. 12th Ave, Emporia. All proceeds from the barbecue benefit Relay for Life of the Flint Hills, a non-profit organization that raises money for the American Cancer Society. The funds raised through Relay For Life of the Flint Hills go to helping those in the Lyon County community who are battling cancer. A donation of $5 per person is suggested. Hot dogs, baked beans, chips, drink and dessert will be served. The Central Care Cancer Center team will be grilling and giving tours of the cancer center during the barbecue. For more information, contact Justin Branine, Central Care Cancer Center, justin@cccancer.com, 620-342-1117.